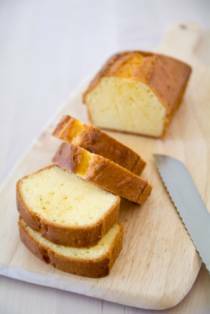 If you desire "real" vanilla taste, then you'll love this double vanilla pound cake using both vanilla extract and vanilla beans in the recipe. The cake is heavenly and goes so well with coffee, tea and of course, any fresh fruit. If you like, sprinkle a little confectioners' sugar over the top of cake after it's cooled and ready to be served. Preheat oven to 325°F/160°C. Lightly grease an 8 1/2 X 4 1/2-inch loaf pan, preferably glass, and dust with flour. In a bowl, whisk together the flour, baking soda and salt until blended. In the bowl of an electric mixer, beat together the butter, sugar, vanilla and scraped vanilla beans from the split vanilla bean on medium to medium-high speed until light and fluffy. Add the eggs one at a time, beating well after each addition until just blended. Sprinkle half of the flour mixture over the egg mixture and stir until both are just incorporated. Stir in the sour cream, then sprinkle with the remaining flour mixture and stir until evenly distributed. Pour the batter into prepared loaf pan and tap gently on the counter to even out and settle the ingredients. Bake in preheated oven until a toothpick inserted into the center comes out clean, about 70 minutes, or longer if using a metal pan. Transfer the pan to a wire rack and let cool for 15 minutes. Run a thin knife around the inside of the pan, invert the cake onto the rack and lift off the pan. Place the cake on one of its sides and continue cooling. Serve warm or at room temperature. If serving cake at room temperature (cool, not warm), sprinkle top of cake with confectioners' sugar, if desired. Simple and absolutely delicious. My whole family loved it. Thanks for a great recipe. Can you use this recipe for cupcakes?...I'm in desperate need of a vanilla cupcake recipe. But it seems like every recipe I found on vanilla cupcakes with butter in the recipe seems to sink in the middle as they bake. What am I doing wrong? Please advise!